The American Recovery and Restoration Act of 2009 provided $3.3 million to grow about 30,000 threatened staghorn and elkhorn coral colonies in underwater nurseries. About 10,000 of the fast-growing corals are being transplanted in eight areas along a 300-mile reef tract from Broward County to the Florida Keys, and in the U.S. Virgin Islands. The goal of the transplants is to spawn tens of thousands more coral colonies. "We're just giving them a jump start," said The Nature Conservancy's James Byrne, the marine biologist overseeing the three-year project. "Now, if they can successfully reproduce, it will blow away anything we can do," he told The Miami Herald (http://hrld.us/JCwSEm). The money was part of $167 million given to coastline restoration projects; the entire stimulus package totaled $831 billion. The funding, which created or supported 56 jobs, ends in December. "Before, most coral restoration efforts focused on places with large (vessel) groundings," said Sean Morton, superintendent of the Florida Keys National Marine Sanctuary. "This is the first attempt to do it reef-wide and turn around a long-term trend of coral reef decline." Scientists say staghorn and elkhorn coral populations have declined by about 90 percent throughout the Caribbean over the last 30 years. Many factors have contributed to the decline, including a die-off of algae-eating spiny sea urchins, disease caused by bleaching from rising water temperatures, ocean acidification, water pollution and hurricanes. "If you went snorkeling or diving anywhere in the Caribbean in the early '80s, you'd see corals everywhere," Byrne said. "Staghorn used to be the dominant one on the reef, providing almost all the habitat for small juvenile fish to go into. And elkhorn dominated the top of the reef, building big reef crests that waves break on." In 2006, elkhorn and staghorn were the first corals to be put on the threatened list under the Endangered Species Act. "Staghorn is a thinner branching colony that looks like the thin antlers of a young stag," said Erich Bartels, coral science manager at Mote Marine Laboratory. "Elkhorn looks like big moose antlers that go out in a big fan shape." Both corals are important to Florida's ecosystem and economy, scientists say. "This is restoring nature for people's sake. These habitats are nature's infrastructure," said Rob Brumbaugh, The Nature Conservancy's director of global marine restoration. "We're making fish. When you make fish, you make jobs. It's a good investment." Norwich have revealed they are yet to agree financial compensation with Aston Villa after Paul Lambert's switch to the West Midlands club was confirmed. Lambert succeeds Alex McLeish, who was sacked following the final game of the season, to become the fourth boss at Villa Park in less than two years. 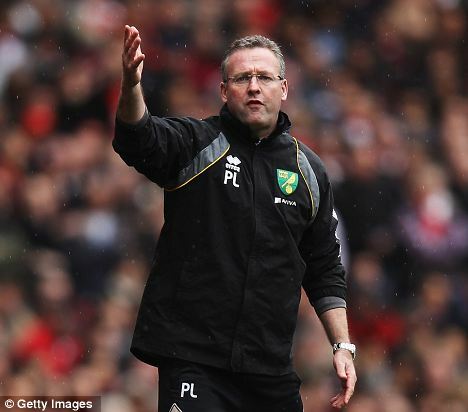 Villa confirmed Lambert's appointment as their new manager, however, Norwich released a statement which revealed the deal has not been fully finalised. It said: 'Following today's announcement by Aston Villa that they have appointed Paul Lambert as their new manager, we would once again like to place on record our sincere gratitude to Paul for everything he has done for the club. 'Everybody at Carrow Road wishes him all the best for the future. Some media reports are suggesting we have agreed compensation for Paul's services with Aston Villa, however this is not the case. 1980: Begins his career at Linwood Rangers Boys' Club as a youngster. 1985: Joins St Mirren and goes on to make 227 appearances for the Scottish Premier League side, scoring 14 goals in the process. 1993: Motherwell manager Tommy McLean signs Lambert and Motherwell go on to have several successful years, qualifying for the UEFA Cup two seasons running. 1996: Joins Bundesliga side Borussia Dortmund. 1997: May 28 - Wins the Champions League as Dortmund overcome Juventus 3-1 in the final. November 7 - Returns to Scotland as he signs for Celtic for a fee in the region of 2million. 2005: Retires from playing and begins his managerial career at Livingston, where he also comes out of retirement to cover injury shortages. 2006: February 12 - Resigns as Livingston manager after winning just two league games. June 30 - Appointed manager of Wycombe. 2008: May 20 - Resigns as Wycombe boss after the club are eliminated from the League Two play-offs. October 9 - Becomes manager of League One Colchester after the departure of Geraint Williams. 2009: Leaves Colchester and replaces Bryan Gunn as Norwich manager, having opened the season with a 7-1 win over the Canaries. 2010: Leads Norwich to the League One title. Also named League One Manager of the Season. 2011: Norwich are promoted to the Premier League. Lambert is also named Championship Manager of the Season. 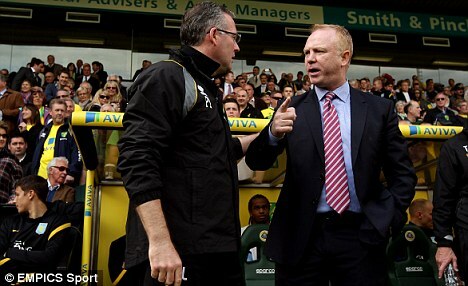 2012: May - Leads Norwich to a 12th-placed finish in their first season in the Premier League. Lambert masterminded the Canaries' rise from League One to the Premier League during his three seasons in charge, but the club confirmed they have already launched the search for his successor. 'The search for the next Norwich City manager is already actively under way and the club has been inundated with applications for and interest in the job of leading this great club forward in the Barclays Premier League,' the statement said. Norwich striker Grant Holt, whose future at Carrow Road is still unsure, bid farewell to Lambert on Twitter. Holt's agent Lee Payne claimed that the 31-year-old forward has been told by Norwich he is 'too old' to be offered a three-year contract. Payne alleged that talks with the club broke down after Canaries chief executive David McNally questioned his age. Holt has scored 15 league goals last season but had a transfer request rejected last month. The new allegations come after Holt took to Twitter to confirm he wants to leave a club he joined back in 2009. The striker said: 'Just to stop the rumour mill again. I have expressed to the board and the CEO that I want to leave the football club. Due to disagreements. No one from the club was immediately available to comment upon Payne's claims. The difficult fact to accept is Villa ARE a bigger club with better prospects. They are an ever present since the Premier league began and until the season before last were regularly a top six side. Villa park can hold about 20000 more than Carrow Road. Lambert probably feels he has taken Norwich as far as he can. Loyalty has nothing to do with anything. He has given Norwich three good years and Norwich paid him. Everyone is equal. Welcome Lambert to AVFC, Good Luck. As a NCFC supporter I am absolutely gutted to see him go, but the way he dumped Colchester I am not at all surprised, Villa fans should expect the same thing when a ''bigger'' club comes knocking. But thank you Lambert for the amazing 3 great years you've even to this club, hopefully we'll carry on the good work and all the best to you at Villa. Is the grass greener on the other side...don't bet on it.. - Old Soldier, And His Dog, 02/6/2012 19:21 It probably is. The lush Villa Park turf usually wins the Premier League Best Pitch award. As a Villa fan I would just like to agree with all the angry Norwich fans and say that Villa are a tiny club (smaller than Norwich and every other club out there). I would like to agree with you that Villa have a rubbish history and Scrooge like Chairman. I'd like to agree with you all that Villa have no better prospects than Norwich or any other tiddling, little club out there. I hope you Norwich fans feel a little bit better now. A warm welcome to Villa Park, Mr. Lambert. A warm welcome to The Birthplace of The League and to the most Historic and Influential club in the game. Is the grass greener on the other side...don't bet on it..
Football used to mean loyalty...as the years have passed it means nothing but money......I'm a little sad Paul has left considering what he has done at NCFC. What is so confussing is that he left only to join Aston Villa...no better prospects and an owner who is a modern day scrounge... At least Norwich is owned by an English lady who is an avid football fan...how many clubs can say they have an owner who is even interested in the great game....very few! Last week was an awesome warning of where go-it-alone austerity can lead. It produced some brutal evidence of where we end up when we place finance above economy and society. The markets are now betting not just on the break-up of the euro but on the arrival of a new economic dark age. The world economy is edging nearer to the abyss, and policymakers, none more than in Britain, are paralysed by the stupidities of their home-spun economics. Yanis Varoufakis, ex-speechwriter for former Greek prime minister George Papandreou and now an economics professor in the US, said last week: "There is precisely zero chance of austerity working. It is the same as thinking you can escape from gravity by waving your arms up and down." It could hardly be more sobering. Money has flooded out of Spain, Greece and the peripheral European economies. Signs of the crisis range from Athen's soup kitchens to Spain's crowds of indignados protesting in the streets against austerity and a broken capitalism. Youth unemployment is sky-high. Less visible is the avalanche of money flowing into hoped-for safe havens in the US, Germany and even Britain. The last time the British government could sell government bonds at interest rates as low as today's was in the early 1700s. George Osborne and his acolytes proclaim this as a triumph of the government's economic policies. They are gravely mistaken. Rather it portends fears that the international economic order may collapse because if so many countries are simultaneously pursuing austerity, where's growth to come from? Virtually everywhere you look there are signs of a weakening world economy. At home, manufacturing suffered its biggest plunge for three years, and this in an economy already suffering its longest depression since the 19th century. American jobs growth is petering out. Unemployment in Europe averages 11%. Even China witnessed a sharp fall away in factory activity in May. Yet none of this should be a surprise. We live in the aftermath of one of the biggest financial and intellectual mistakes ever made. For a generation the world, with the London/New York financial axis at its heart, surrendered to the specious theory that lending and financial contracts could grow many times faster than the underlying economy. There was a blind belief that in a free market banks could not make mistakes. Free markets didn't make mistakes – only clumsy bureaucratic states made economic mistakes. Or so they said. Financial alchemists, guided by the maxims of free market fundamentalism, could make no such errors. Except that they did. The result was the financial crisis of 2008. Had governments not underwritten their overstretched banks with trillions of dollars, euros and pounds, an even worse global slump would have ensued. But while the banks could continue trading, the hundreds of trillions of loans and financial contracts they had made did not go away. And because governments had guaranteed their deposits, as in Ireland, or had to inject capital into them as Spain has been doing all last week, this private bank debt has steadily become public debt. Here is a classic case where all the gains were privatised, and all the losses were socialised. It was the much-maligned state that had to step in and clear up the mess left behind by the private sector. The free market wasn't so free after all – in fact it proved astonishingly expensive for the public purse. People across Europe still pay the price. This is no solution. Overstretched banks have become more cautious about lending new cash; and even strong banks are caught up in the backwash because if they step into the breach they could fall into a vortex of falling property prices and declining economic activity, becoming weak in turn. So as banks stand aside from their crucial function of generating credit, governments and central banks must step in to generate the demand that has now disappeared. But they have not done so to a sufficient degree. Part of the problem is that the more bank debt that governments guarantee, the less room for manoeuvre they feel they have – especially as their stagnating economies forces up welfare spending and depresses tax revenues. But the larger problem is intellectual. The dominant ideology of the day – from the same roots that delivered the crisis – forbids it. A consensus stretching from US Republicans through to Angela Merkel's Christian Democrats via George Osborne's Treasury continues to claim that the state is the source of economic bad. The state threatens enterprise, invites damaging taxation, and is the root cause of spreading inflation. The state must balance the books just as the private sector must. This is not just an economic but a moral necessity, they argue. Living within one's means rather than "maxing" out on debt appeals to American, British and German individualistic Protestantism. Inflation is even more a sign of moral degradation: it means reneging on promises, rewarding spendthrifts and penalising savers. We had the good years. Now we must take our medicine. The public and private sectors must retrench simultaneously worldwide. Enterprise and free markets will do the rest. The "march of the makers" will step in to fill the void left by public austerity measures. This is a first-order moral and economic mistake. Human beings need each other for mutual support. In economic terms this means that no individual, either as a person or a company, can manage existential risk by themselves. That risk needs to be shared and mitigated otherwise the risk is not accepted. There would be no enterprise or innovation – the risks of failure too great. That is why there is a role for both private and public sectors. It is governments who provide the means through which we express our social obligations and pool our risks. This is the heart of Keynesian economics – a different set of moral and economic propositions than those which prevail. Today we can see an almost laboratory experiment on a global scale of why Keynes was right and his detractors wrong. There is no doubt what Keynes would advocate now: a government-sponsored increase in demand co-ordinated across as many countries as possible and an acceptance of a temporary but closely managed increase in inflation to reduce the real value of debt. The enormous legacy of private debt – whether in Britain, Germany, Spain, the US or Greece – and the fiendishly complicated way so many of the loans have been organised and distributed around the world financial system cannot be easily unwound. Sir Philip Hampton, chair of RBS, warned this week it might take a generation for RBS investors to recover their money. The choice is thus stark. To commit to decades of economic stagnation, the break-up of the eurozone, the risk of trade protection and autarchic economic policies, the dismantling of the west's social contracts, the imposition of high unemployment and the political fallout that will follow. The technical means are relatively simple. Governments must replace targets for inflation with targets for the growth of prices and growth of output combined. Central banks should inject money into their financial systems by offering to buy new bank loans made to support new investment, new innovation or new infrastructure – helped by partial government guarantees. Governments also need to increase demand. They can do this directly – with targeted and time-limited tax cuts or spending increases. They can also move indirectly, taxing the rich more aggressively and re-allocating the proceeds in tax cuts to those on middle incomes and lower who tend to spend more – along the lines that both presidents Obama and Hollande have proposed. There is also a case for a financial transactions tax – both to raise crucial revenue and to cap the growth and frenetic speed of financial transactions. Finance has become too powerful. It needs constraining. Will any of this happen? The west is at a cross-roads, and although such proposals will be fiercely opposed by the British, German and American right they need to be beaten back. After all, it is their ideas that have brought us to this pass. It is not too fanciful to argue that the future of western capitalism depends upon how this argument plays out – and how quickly, if at all, there is a change of course.